The JP is a seasoned patty laying between two grilled cheese sandwiches with grilled mushrooms and onions, bacon and mayo. When Classic Burgers hosted its first contest, Danelle Dias and her uncle John Paul agreed if it came around again, they would blow away the competition. “He said, ‘Next time, we’ll make a burger and win this thing,’” Dias recalled. In December 2015, Dias’ uncle passed away, but his prediction proved correct. Dias and her burger, named “The JP” in her uncle’s honor, ran away with the grand prize at the second annual burger contest. While her uncle had an idea to build a burger to emulate Portuguese cuisine, Dias opted to go in a different direction that would still capture her uncle’s spirit. The result was a seasoned hamburger patty crammed between two grilled cheese sandwiches with grilled mushrooms and onions, bacon and mayo. Classic Burgers Managing Partner Harry Anischik explained he and Manager Ryan Chapman received a number of applications for recipes and narrowed the list to eight. To achieve top billing, contestants had to pit their burgers against other burgers in a bracket tournament format starting in mid-January and running through February with the finals concluding in early March. For a week, two burgers were included on the menu and made by the staff. Whichever burger was ordered most often advanced in each round. In addition to offering additional exposure, feedback from the contest can help the company understand its customers better. For Dias, the feedback was immensely positive. “I want people to enjoy it. I want people to get that ‘mmm-mmm’ feel, that really homey, comfort taste and I think that’s what people are getting,” she said. “I heard someone say it was one of the best burgers they ever had. Someone said it was ‘cheesy goodness.’ All the comments were amazing. With the title Dias received a trophy and prize money, but most importantly, her uncle’s burger will remain on the restaurant’s menu for a full year. “That’s the best part – everyone, all your family and your friends, get to see your burger on the menu,” Chapman said. 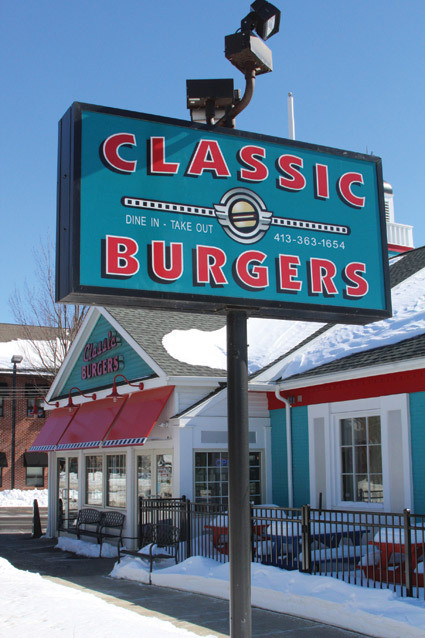 To try The JP, visit Classic Burgers at 1261 Westfield St. For more information, visit www.classicburgers.net or www.facebook.com/ClassicBurgers.net.